In September, a Skamania County woman was attacked by five dogs—pit bulls of varying size—owned by a neighbor. She was at the Skamania General Store when the neighbor told her he had a litter of puppies and offered her one. So, she followed him up the road to his house. As the woman got out of her car, the neighbor’s daughter opened the door to the house, and five dogs came rushing toward her. The ensuing attack left the woman with dog bites, a broken arm, torn flesh, and her right knee was popped out. Medics transported her to PeaceHealth Southwest Medical Center (after she drove herself back to the general store! ), where she spent several hours in surgery. Read on to learn how a dog bite case like this may be handled under Washington and Oregon law. Washington’s dog bite statute, Revised Code of Washington, Section 16.08.040, states: “The owner of any dog which shall bite any person while such person is in or on a public place or lawfully in or on a private place including the property of the owner of such dog, shall be liable for such damages as may be suffered by the person bitten, regardless of the former viciousness of such dog or the owner’s knowledge of such viciousness.” In other words, Washington is a “strict liability” state when it comes to dog attack injury liability, which means that a dog owner may be liable the first time a dog bites, even if the owner didn’t know and had no reason to know the dog might bite someone. The two defenses available to a dog owner facing a dog bite lawsuit in Washington are provocation and trespassing. So, if the dog attack victim did something to cause the dog to attack, or if he or she was on private property unlawfully, the dog owner may avoid liability. Dog bite cases are handled differently in Oregon. Cross state lines and strict liability doesn’t apply. Oregon’s dog bite laws only impose liability on a dog owner if the dog is a “potentially dangerous dog,” which is a dog that menaces a person while the dog is not on the owner’s property, inflicts physical injury on a person, or injures or kills a domestic animal while the dog is not on the owner’s property. In all these circumstances, the dog must not be provoked. 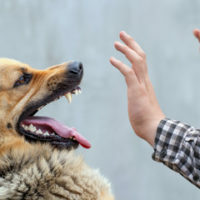 Oregon also uses a “one bite” rule, shielding a dog owner from liability if he or she does not know or has no reason to know a dog might act aggressively. Only once one bite or injury has occurred, and the owner is “on notice,” may he or she be held liable for subsequent injuries caused by the dog. Because of the “one bite” rule, lack of prior knowledge of a dog’s potential danger to others is an additional defense for dog owners in Oregon, along with provocation and trespassing. Regarding the dog attack case described above, Washington law pins liability on the dog owner, and there doesn’t seem to be an issue of provocation or trespassing. (The woman had only gotten out of her car, and she was invited to the neighbor’s home.) On the other hand, Oregon law would require the woman to show the dog owner knew his dogs were dangerous. She could likely make a case based on additional evidence, but the law isn’t automatically on her side. If you or a loved one has sustained a dog bite or dog attack injuries, it’s important to talk to an experienced personal injury attorney familiar with state law. In the Vancouver, WA area, contact John Lutgens, Attorney at Law, for a free initial consultation.